Download "Eugene School District 4J Professional School Counselor Rubric"
1 Eugene School District 4J Professional School Counselor Rubric Using leadership, collaboration and advocacy, the Professional School Counselor plans, delivers, manages and promotes a comprehensive guidance and that focuses on student needs and outcomes. As an integral component of the school s academic mission, the Comprehensive Guidance and Counseling Program provides systematic, developmental, culturally responsive guidance and counseling essential to the success of each and every student. Data driven and student centered, the Comprehensive Guidance and Counseling Program focuses on the needs, assets and potential of each student in the areas of academic, social/emotional, career, and community involvement. Definitions and Acronyms ASCA America School Counselor Association CGCP Comprehensive Guidance and Counseling Program PSC Professional School Counselor OCGCF Oregon Comprehensive Guidance Counseling Framework OSCA Oregon School Counselor Association SIP School Improvement Plan TSPC Teacher Standards and Practice Commission Yearly Action Plan A document that guides the action plan for the Counselor for the year, including goal based actions, program delivery, development, and collaboration. 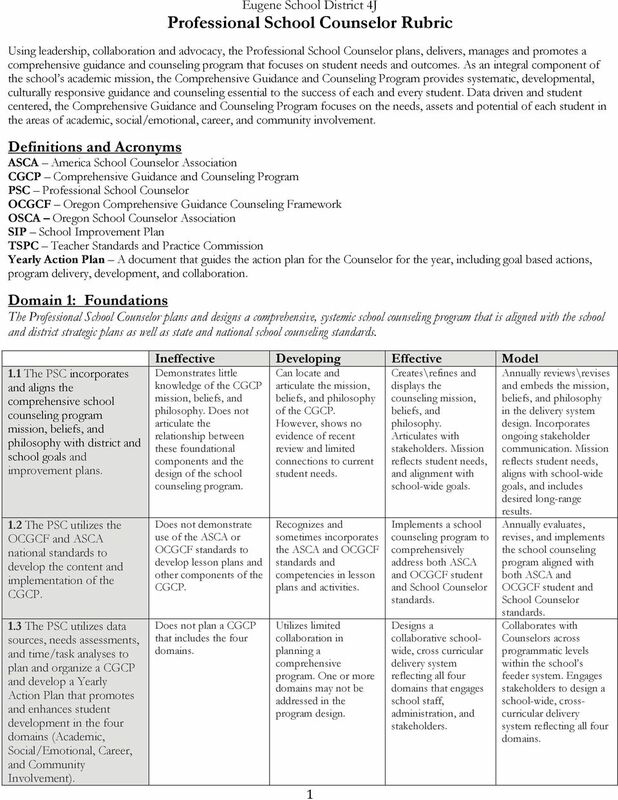 Domain 1: Foundations The Professional School Counselor plans and designs a comprehensive, systemic school that is aligned with the school and district strategic plans as well as state and national standards. 1.1 The PSC incorporates and aligns the comprehensive school mission, beliefs, and philosophy with district and school goals and improvement plans. 1.2 The PSC utilizes the OCGCF and ASCA national standards to develop the content and the CGCP. 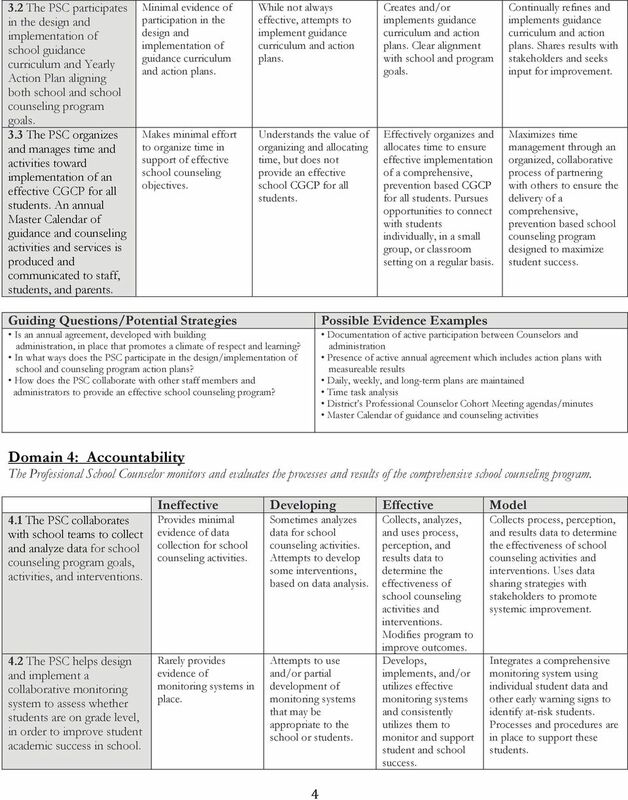 1.3 The PSC utilizes data sources, needs assessments, and time/task analyses to plan and organize a CGCP and develop a Yearly Action Plan that promotes and enhances student development in the four domains (Academic, Social/Emotional, Career, and Community Involvement). Demonstrates little Can locate and Creates\refines and Annually reviews\revises knowledge of the CGCP articulate the mission, displays the and embeds the mission, mission, beliefs, and beliefs, and philosophy counseling mission, beliefs, and philosophy philosophy. Does not of the CGCP. beliefs, and in the delivery system articulate the However, shows no philosophy. design. Incorporates relationship between evidence of recent Articulates with ongoing stakeholder these foundational review and limited stakeholders. Mission communication. Mission components and the connections to current reflects student needs, reflects student needs, design of the school student and alignment with aligns with school-wide. school-wide goals. 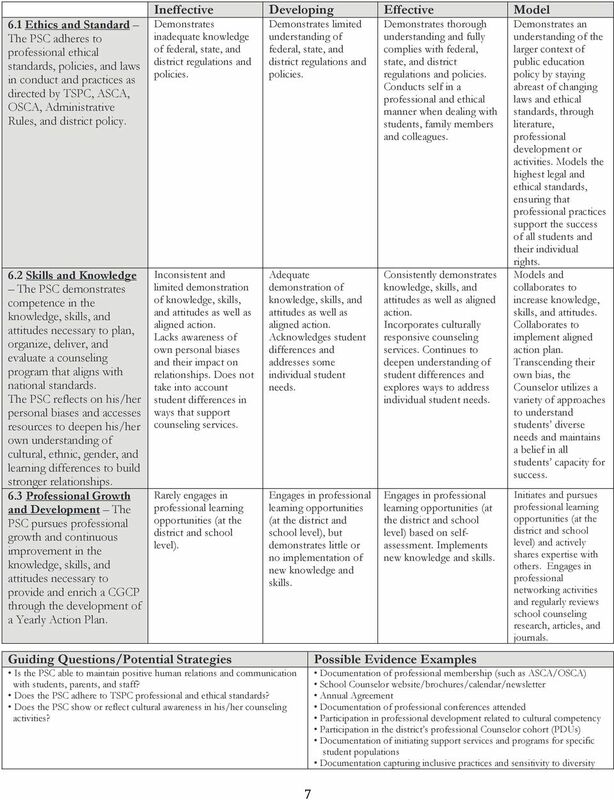 goals, and includes desired long-range Does not demonstrate use of the ASCA or OCGCF standards to develop lesson plans and other components of the CGCP. Does not plan a CGCP that includes the four domains. 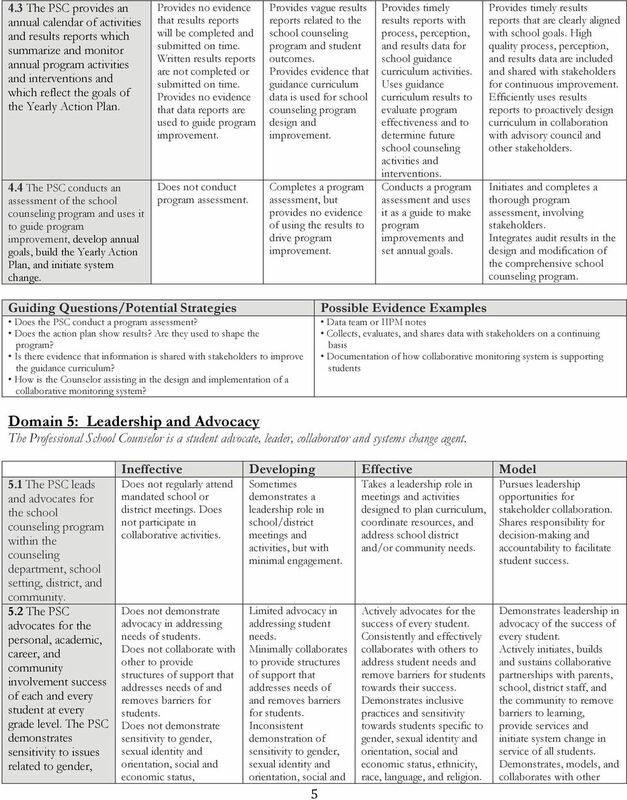 Recognizes and sometimes incorporates the ASCA and OCGCF standards and competencies in lesson plans and activities. Utilizes limited collaboration in planning a comprehensive program. One or more domains may not be addressed in the program design. 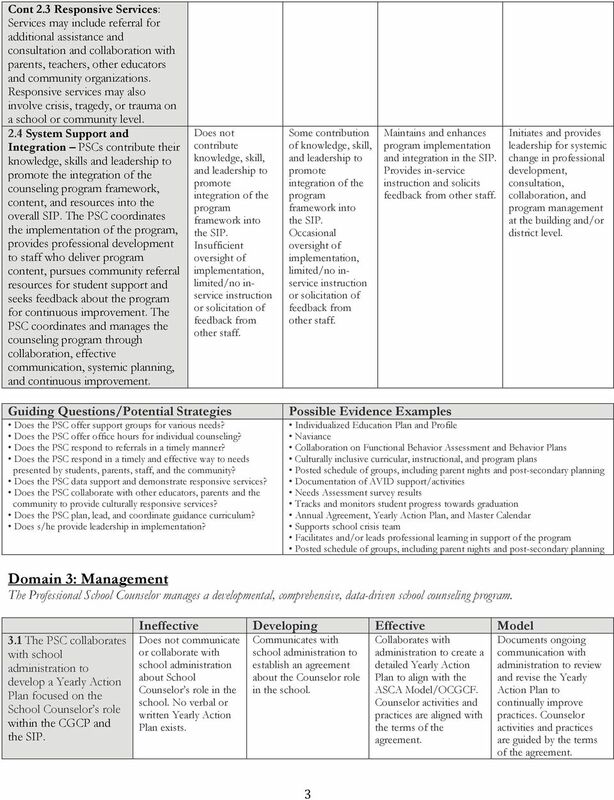 1 Implements a school to comprehensively address both ASCA and OCGCF student and School Counselor standards. 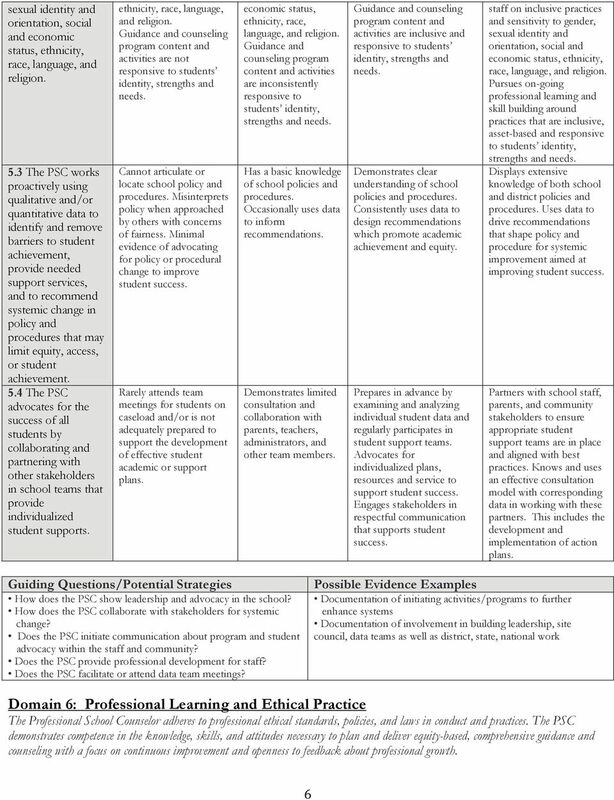 Designs a collaborative schoolwide, cross curricular delivery system reflecting all four domains that engages school staff, administration, and stakeholders. results. Annually evaluates, revises, and implements the program aligned with both ASCA and OCGCF student and School Counselor standards. Collaborates with Counselors across programmatic levels within the school s feeder system. 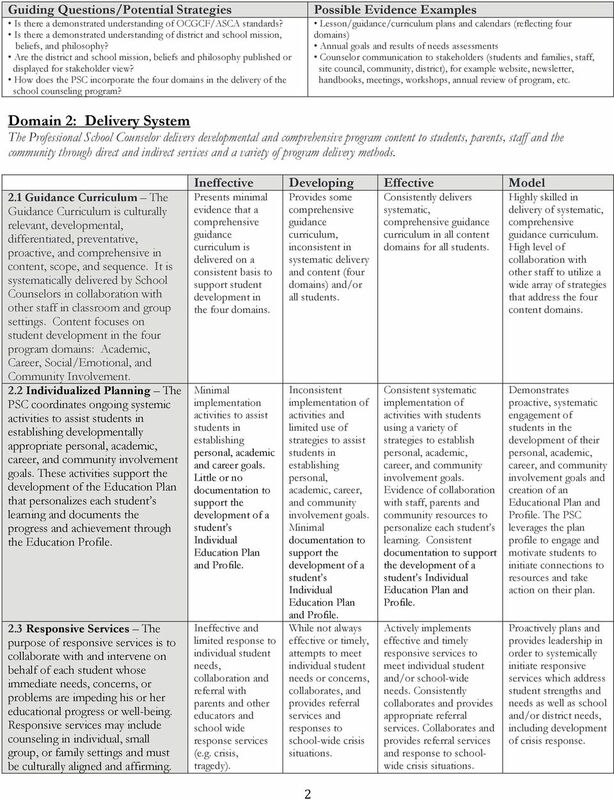 Engages stakeholders to design a school-wide, crosscurricular delivery system reflecting all four domains.